Thanks to everyone who attended the Labs21 2011 Annual Conference last month in Providence, Rhode Island. This year's event was one of the most fulfilling and inspiring that I've had the privilege to be a part of, and its success was due to all of our participants' hard work. From your efforts in planning symposia, to speaking during sessions, instructing and attending workshops, and organizing tours and working group events, this conference is truly your conference. And while the 2011 conference might be over, there is still much work to be done. We will continue to move forward with our working groups and the Student Design Competition, among other projects, throughout the coming year. And, of course, planning for the Labs21 2012 Annual Conference is already underway. I2SL would like to give a special thanks to this year's keynote speaker, The Honorable Lowell Weicker, Jr., for speaking to the importance of readiness and safety in modern laboratories. Governor Weicker is the President of the Board of the Trust for America's Health. We encourage you to learn more about the important work this organization is doing to protect America from needless health risks, and read the notes from Governor Weicker's address. In other I2SL news, we are proud to announce the addition of two new Board of Directors members: Franco Atassi of Siemens Industry, Inc., Building Technology Division and Wendell Brase of the University of California, Irvine. These gentlemen will offer their expertise to help I2SL move ahead with new opportunities and initiatives that will help create and maintain sustainable laboratories worldwide. I2SL would also like to honor Dr. Kath Williams, who recently retired from her position as I2SL's Vice President. Kath was one of the founding pillars of the I2SL Board of Directors, providing support and guidance during the initial stages of the organization. Without her, I2SL wouldn't be the organization that it is today. Stay tuned throughout the year while I2SL announces new initiatives and prepares you for additional ways you can get involved and advance sustainable, high-performance facilities the world over, especially in your own backyard. I2SL is pleased to once again work with R&D Magazine to post extended abstracts from the conference in its December newsletter and in the I2SL E-Library in November. Learn about topics such as practical applications of building information modeling and carbon neutral laboratories and read case studies on unique facilities from around the globe. Want to share your thoughts about the conference? We want to hear them! Please fill out the post-conference evaluation form to tell us what you thought worked well this year and what we could improve for coming years. Are you anxiously waiting for the 2011 conference presentations so that you can dive back into the great information you learned at this year's event? You won't have to wait too much longer. I2SL plans to post these files to its website in the coming weeks. Access will be free for anyone who attended the Labs21 2011 Annual Conference. Conference attendees should keep an eye out for an email from I2SL with access instructions. Want to dig deeper? The Labs21 2002-2010 Annual Conference Presentations Archive contains nine years worth of Labs21 presentations. Gain guaranteed access to this valuable information by subscribing to the archive today. Non-conference attendees can subscribe to the archive to access the 2011 presentations. Who Are the 2011 Go Beyond Award Winners? I2SL, in partnership with R&D Magazine, is pleased to acknowledge the winners of the fourth-annual Go Beyond Awards. Go Beyond Award winners show their commitment to the goals of Labs21 and demonstrate that excellence in sustainability means going beyond the laboratory, beyond the United States, and beyond being green when considering building projects, products, and services. 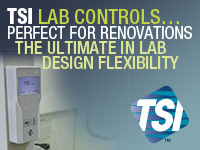 During the coming year, I2SL will highlight each of these winners' accomplishments in the Sustainable Laboratory Times newsletter and in R&D Magazine's Laboratory Design Newsletter December issue. Congratulations to this year's winners! Did you know that 85 percent of the Labs21 2011 Annual Conference attendees who have purchasing power are planning to start a new project in 2012? Show these influential decision makers how your products and services can help them meet their needs by exhibiting in the 2012 Technology and Services Fair. 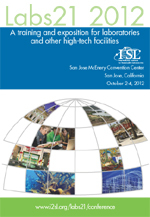 Information on the 2012 Technology and Services Fair is now available on I2SL's website. Register today before prices go up and the prime booths are taken! 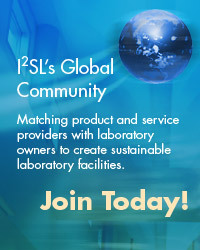 Looking to market your product or services to the sustainable laboratory community? Want to broaden the reach of your company's promotion? Then look no further than Labs21 2012 Annual Conference sponsorship. For the Labs21 2012 Annual Conference, we're headed back to San Jose, California. When the Labs21 Annual Conference touched down in this hotbed of technology in 2008, we experienced our best attendance in the event's history. Four years later, our program is still going strong. Make yourself visible to this influential audience through conference sponsorship, which starts as low as $500. Sponsor early and receive an entire year's worth of exposure. It's not too early to start composing your thoughts for the Labs21 2012 Annual Conference Call for Presenters. In January, we will open the call to the I2SL community, with requests for presentations on the latest innovations in sustainable, high-performance laboratories and other high-tech facilities. 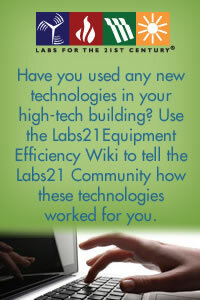 Check the Labs21 2012 Annual Conference Web page for more information in the coming months. If you live or work in northern California and/or have ideas for the Labs21 2012 Annual Conference in San Jose, I2SL wants to hear from you. Join the Labs21 2012 Annual Conference Planning Committee and share your ideas for offsite tour locations, region-specific session topics, local speakers, and more. Contact I2SL if you would like to participate in the first planning committee call, which will take place in early December 2011. Were you lined up out the door for Gordon Sharp's Tool-Torial presentation, "A New Return on Investment and Energy Analysis Tool for Evaluating Laboratory Energy Savings Strategies"? You weren't the only one! Due to overwhelming demand, Mr. Sharp, the chairman of Aircuity, and a world-renowned energy efficiency expert, will give an encore of his highly regarded presentation on his energy analysis tool during an upcoming I2SL High-Tech Talk webinar. This tool has been validated by multiple utilities and is currently being used for energy incentive rebate calculations. If you're concerned about your carbon footprint, this tool can help you see the environmental impact of energy savings approaches in terms of metric tons of carbon dioxide saved, among other metrics. Don't miss this Web event! Join us December 9 from 1:30 to 2:45 PM EST for this highly valuable webinar. Questions encouraged; register today! Do you have a new application or technology that you'd like to share with the laboratory and high-performance facilities community? The I2SL High-Tech Talks Webinar Series is a great way to connect with this engaged audience. Apply to present your tool by submitting an abstract of no more than 250 words, plus four learning objectives, to I2SL today. I2SL would like to thank Kath Williams, Ph.D., LEED® Fellow, for her years of dedication and support as one of the founding Board of Directors members for I2SL. When Dr. Williams joined I2SL's Board of Directors, she brought with her unparalleled organizational experience from the leadership role she occupied in the U.S. Green Building Council (USGBC), serving as its vice chair from 1996 to 2004. Recently, Dr. Williams was designated as one of the first 34 LEED Fellows by the Green Building Certification Institute. Dr. Williams was elected President of the World Green Building Council in 2005, was re-elected for three terms, and was honored to be the first Fulbright Senior Specialist in sustainability. She is a frequently invited author and keynote speaker on green buildings, sustainable laboratories, and the integrated design process. She has also chaired two USGBC member summits, served on Greenbuild steering committees, and served as the Greenbuild program coordinator for five years. We support Dr. William's endless pursuit of improving the conditions and standards of high-performance buildings and laboratories. Her insider's view helped provide I2SL with the tools it needed to reach a wider audience and move into new and exciting arenas. We wish Dr. Williams all the best during this next stage in her career. 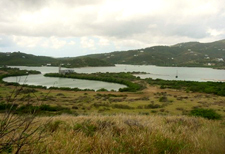 Site of the planned Marine Research and Education Center on St. Croix, the real-life project site that students will design for in the competition. Judging: I2SL and the American Collegiate Schools of Architecture (ACSA) are developing a panel of judges to evaluate the submissions next summer. If you are interested in being on this panel, please contact I2SL. The criteria for judging can be found in the competition program. Sponsorship: If your organization would like to align with I2SL and the U.S. Department of the Interior's Office of Insular Affairs in sponsoring this worldwide student competition, please contact I2SL as soon as possible. I2SL welcomes all donations and will work with sponsors to appropriately recognize their support based on their donation level. Promotion: If you have access to students of laboratory architecture, engineering, or planning, be sure to introduce them to the competition. Complete competition information can be found on ACSA's competition website. 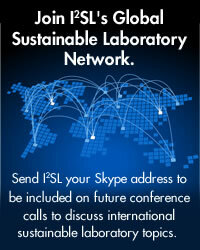 Continue reading the Sustainable Laboratory Times for updates on the competition, including participating schools from around the world, new sponsor promotion, our panel of judges, and information on the winner recognition ceremony, which will be held at the Labs21 2012 Annual Conference in San Jose, California. Jim Plourde, Schneider Electric • Gordon Sharp, Aircuity, Inc.